Horizons 4th Grade Health teaches students how God made them! This fun-filled health course has a teacher's guide, a student workbook, and a student book. Essential health themes include living in the community, eating healthy food, learning how the body works, understanding nutrients, and making wise choices. The 55 step-by-step lessons in the teacher's guide include a list of needed materials, objectives, background information, lesson overviews, and related activities. The student workbook contains unit evaluations and over 40 perforated, colorful student visuals and writing activities that are teacher-administered. The full-color student book includes photos, illustrations, additional readings, and questions to reinforce the lessons. 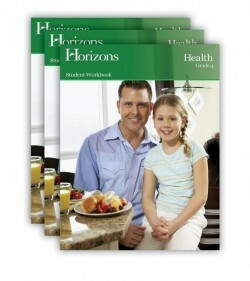 Horizons Health curriculum is created to be taught two to three days per week.